Dinner & A Magic Show! 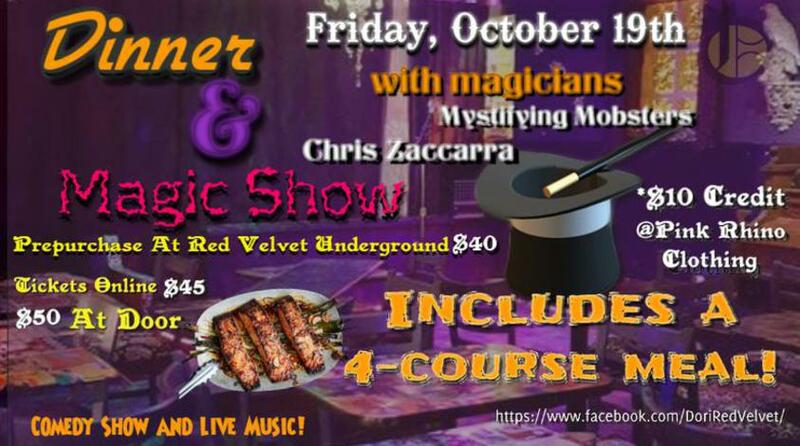 Dinner & A Magic show is a special event happening on October 19th, and are selling out limited tickets! This ticket includes a 4-course meal, $10 of credit to spend at the Pink Rhino Clothing store, and a fully featured magic show with Chris Zacarra, and Raul E. Lorenzoni! To purchase your ticket, you may submit your name, e-mail, and phone number with the submission form below. You can also go to the Red Velvet Underground Cafe and purchase them for $40. If you would like to get your tickets at the door on the day of the event, they will be sold for $50 each.